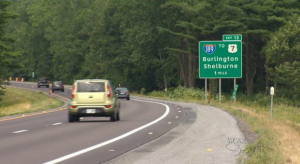 A road construction worker from Richford, Vermont was killed while removing temporary reflective fog line markers on I-89 in South Burlington, Vermont. A 22 year old from South Burlington struck and killed the road construction worker with her vehicle at about 11:15 p.m.
Workers compensation insurance coverage will be needed to compensate the road construction worker’s family for their loss. It is likely that the workers compensation company will subrogate against the driver’s car insurance company.